This year's Met Gala promised to be an interesting one, what with the punk theme and all. I am quite glad I don't blog about womenswear these days because, truth to be told, the list of misses is much longer than that of hits. It was, however, a great night for menswear. Whether it the guys went for classic looks or for a daring one adhering to the theme, a lot of them were simply spotless. Nicholas Hoult was my absolute winner, his midnight blue moiré shawl collar tuxedo jacket by Tom Ford was chic, young and was cut to perfection. I've been raving about this guy for months and, if you were still doubting, this is why. Matthew Mosshart doesn't tend to get a lot of attention, which is usually directed to his always fatally dressed girlfriend Kelly Osbourne. Last night, the model went for a super cool take on an evening suit with a midnight blue-trimmed black double-breasted jacket and matching midnight blue trousers. The perfect detail was the silk bow replacing a classic bowtie. 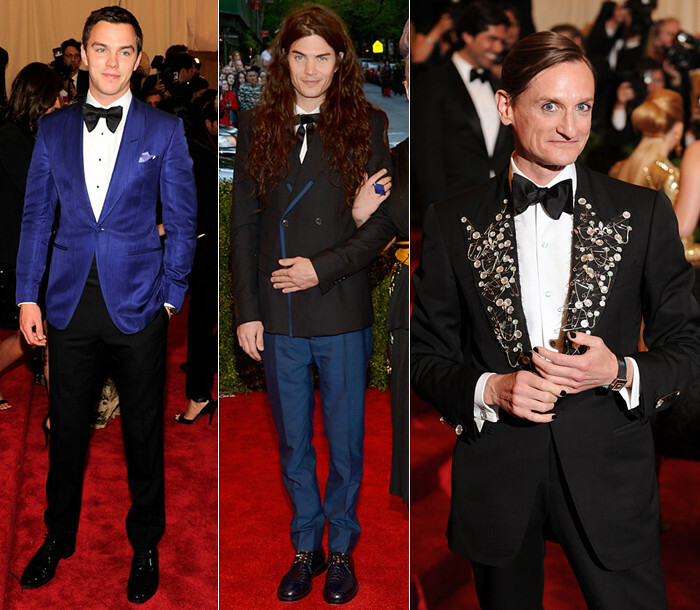 Hamish Bowles has always been one of the most imacuately dressed gentlemen in the industry. He has an extraordinary ability to stay classic and elegant yet daring and witty. He donned an off-the-charts Tom Ford tux jacket embroidered with safety pins and mother-of-pearl buttons. He also went for a bit of man-liner and a black manicure, which not only admire but applaud. Pharell Williams chose Lanvin once again. His stunning patterned suit in a classic shape was enough to stand out but the slight eye-shadow and gold ring made the look even more memorable. Another guy who I always admire for his pushing the (fashion) envelope is Jamie Campbell Bower. The British actor wore a Moschino tuxedo with safety pin embellished collar and cummerbund and black and white spectator shoes. To top it all off, he went for a sick (I've always wanted to use that expression) and hair style and a nose ring very apt for the theme. It wouldn't be a great fashion event without Eddie Redmayne, who wore Dior Homme last night. The actor looks as slick as he does comfortable in a tux. Midnight blue is a favourite choice of mine (have I eve mentioned it?) and Eddie wears it best! Armie Hammer chose to wear Ralph Lauren. His ivory dinner jacket was a breath of fresh air amongst the other dark choices. I would have just loved to maybe see more of a punk note on him. Though, truth to be told, he did wear skull and crossbones cufflinks. Jamie Lannister – I mean, Nikolaj Coster-Waldau wore a Brunello Cucinelli tux also in midnight blue. His was a more traditional take on the evening suit but there is something about the old-school part-in hairstyle and untidy bowtie that makes it look just right for me. Dane DeHaan never gets enough credit for his off-beat fashion choices. The new Harry Osborn wore an all-black Prada suit. His odd haircut, the studded silk tie and the tasselled loafers are as unexpected on his as they're cool.